The full drum sheet music for “Funkytown” by Lipps Inc. from the album Mouth to Mouth (1979). 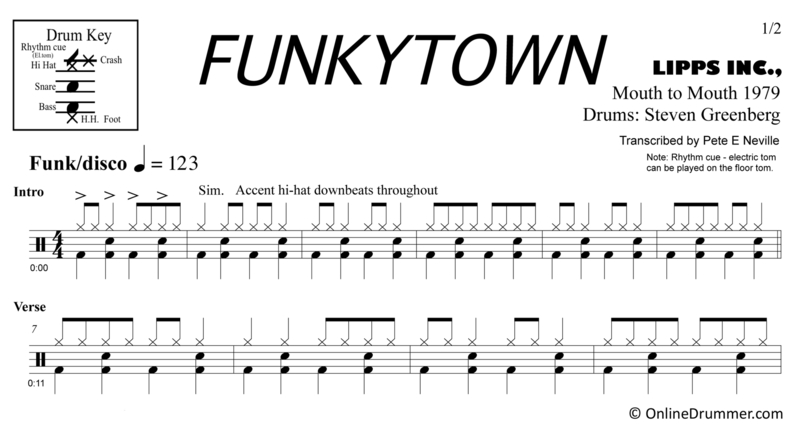 Categories: Drum Sheet Music, Level 2/4 Band: Lipps Inc.
We’ve taken you to … Funkytown! This classic piece ushered in the ’80s and has been a staple dance song at parties and clubs ever since. The hi-hat work is funky and dynamic. Be sure to emphasize the downbeats on the hi-hat throughout this song (i.e. beats 1, 2, 3, 4). There are some additional hi-hat dynamics notated as well. If you’re going to go to Funkytown, the dynamics are key.